Feb. 22th, 2018, Taipei- Advantech, a leading embedded computing solution provider, today detailed its forthcoming roll-out plan for its new high-performance computing and graphics module solution, SOM-5871, prior to the opening of Embedded World 2018. SOM-5871 is equipped with the latest and first 14nm AMD RyzenTM Embedded V1000 Processor (12-54W TDP) with up to four cores and eight threads. 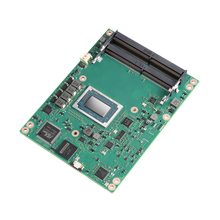 The AMD “Zen” core micro-architecture on the new COM Express (PICMG COM.0) R3.0 Type 6 basic module provides high computing power, and advanced graphics performance. With the integration of the AMD Ryzen Embedded V1000, the SOM-5871 can offer an ideal balance of superior performance and low power consumption for Advantech customers. SOM-5871 uses up to 32GB of dual channel DDR4 3200 MT/s memory (both ECC and non-ECC) with higher memory bandwidth for better performance and efficiency. The new COM Express Basic module supports quad independent displays with VGA, LVDS, eDP, DisplayPort, HDMI, and HDR playback support. VP9 decode and H.265 (HEVC) hardware decode and encode as well as four 4K display outputs are supported by leveraging the AMD Ryzen Embedded V1000. The premium performance of the SOM-5871 drives 4K animation and content. SOM-5871 is built for use in demanding applications such as casino gaming, arcade gaming, digital signage, medical, industrial control, automation, thin clients, and communications infrastructure fields. SOM-5871 adopts 10/100/1000 Mbps speeds Ethernet controller and flexible I/O interface options with: 1 x PCIex4, 3 x PCIex1 through a PCIe Bridge, 2 x SATA Gen. 3 @ 6.0Gb/s, 3 x USB 3.0, 8 x USB 2.0 via USB Hub, 2 x COM ports (2-Wire), TPM 2.0, CAN Bus function (optional support), watchdog timer, and GPIO to fulfill a wide variety of functions and high performance system extension requirements. And for better structural integrity, SOM-5871 added an extra mounting hole design around the CPU for a stronger board structure that avoids board bending and improves thermal throughput to fulfill higher CPU TDP requirements. Advantech iManager provides a valuable suite of programmable APIs such as multi-level watchdog, hardware monitor, and other user-friendly interfaces. Since this is a built-in solution on chip, iManager ensures that functions operate even if the operating system fails, helping enhance system stability and compatibility, and reducing effort on carrier board design and platform migration.